Heli-skiing, the practice of dropping skiers on top of high mountain summits with a helicopter, has long since been banned in France. Fans of the sport have had to sneak over the border with Switzerland or Italy to get their fix. Much to the chagrin of French environmentalists their pilots often drop skiers on, or sometimes just over, the border with France. Switzerland, with its strong record on environmental issues doesn’t seem like the natural home for the sport. As part of the 2002 United Nations International Year of Mountains two motions were tabled in the Swiss National Parliament. These asked the Civil Aviation Authority (Bundesamt für Zivilluftfahrt - BAZL) to examine the practice of heli-skiing and to formulate a plan aviation infrastructure (Sachplan Infrastruktur Luftfahrt - SIL). In particular the parliament wanted heli-ski drops banned in UNESCO classified nature reserves and called for a reexamination of the entire 42 designated mountain landing zones. In theory heli-skiing is highly regulated in Switzerland with drops only possible at certain designated landing spots. Heli-skiing also has powerful advocates at the Cantonal (regional government) level and within the ski industry. The council of the French speaking cantonal governments has recently spoken out to defend the practice. Some in the industry have said restrictions would spell economic catastrophe. For some ski guides heli-skiing represents 40% of their earnings. One industry player, Air-Glaciers, flies between 5,000 and 10,000 skiers during a winter season. However their chief pilot Jo Pouget says that although heli-skiing represents 10 to 15% of flying hours it only contributes 5% to revenue. He advances an alternative argument saying that heli-skiing is a vital training ground for the real rescue missions undertaken by his pilots. We spoke to a senior French rescue pilot about this important point. He told PisteHors flying sufficient hours was a real problem for rescue pilots. However he was dubious about the heli-skiing argument saying that nothing could replace the experience gained in real rescue missions. Elsbeth Flüeler, director of campaign group Mountain Wilderness Switzerland (MWS) says that the “noise from helicopters not only disturbs wild animals but many walkers and ski tourers who are looking for a bit of peace and quiet in the mountains”. MWS has organised a number of demonstrations at landing spots as well as reporting illegal flights by Air-Glaciers and Air-Zermatt. MWS and the bird protection groups have called for at least 22 landing spots in sensitive areas to be abolished. There have been allegations that officials in the Swiss Aviation Authority have been turning a blind eye to illegal drops made by Air Zermatt and Air Glaciers and that they are too close to the industry. In the first round of consultations which finished on the 25th of September the Authority defended the status quo. They also suggested trading landing spots between cantons. Those with low-lying or underused spots could transfer these to heliski hotspots such as Zermatt and the Valais. This would result in an increase in the potential for heli-skiing in Switzerland although dispersed over more landing zones. The opposite of the intent of the 2002 motions. The authority has also proposed “Valdez” style sectors. Areas of 30km2 where heliskiing will be completely unrestricted on the lines of the North-American model. 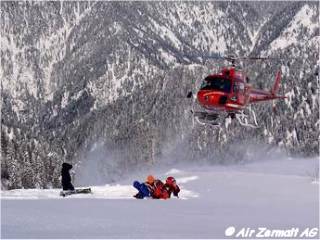 As expected the Swiss Federal Government has decided to maintain the status quo with regard to heliski landing sites. However they have charged the aviation authority with reviewing the current 42 landing places before 2010.